Councillor Rae Evans has been elected as the new mayor for Telford and Wrekin to represent the borough for 2016/17. 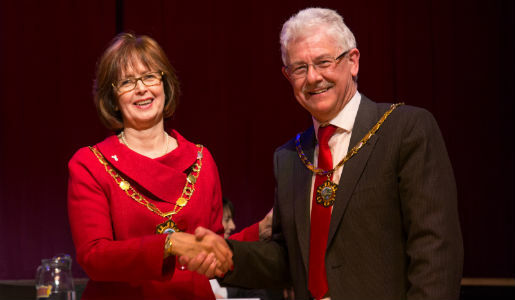 The new Mayor was elected at Telford & Wrekin Council’s annual meeting last night (26 May), along with the election of Councillor Stephen Reynolds as Deputy Mayor. Councillor Evans said: “I’m delighted to have been elected as the Borough of Telford & Wrekin’s Mayor and I am very much looking forward to the year ahead. Councillor Evans was brought up in Oxfordshire. After completing a teacher training course at Worcester College of Higher Education, she moved to Telford in 1977. She became actively involved in the local community as a Trade Union member which later led to her involvement in local politics. She has previously been a member of Bridgnorth Town Council and is still currently a member of Madeley Town Council, where she has been chairman four times. Councillor Evans has also previously worked for the Training and Enterprise Council and the Shropshire Chamber of Commerce delivering training and business development support. She is currently head of HR for Bethphage, a local charity which supports people with learning disabilities while undertaking her role as a borough ward member for Woodside. Councillor Stephen Reynolds will be deputy mayor for 2016/17. Stephen is the current mayor of Oakengates and a member of Trench and Wrockwardine Wood Parish Council since 2011. He became a borough councillor at last year’s election. Stephen’s personal interests include collecting CDs and records, local history and travel.